Optoma HD50 review | What Hi-Fi? Big, bold and bright – the Optoma HD50 projector’s picture is certainly attention grabbing. A punchy, colourful Blu-ray like Guardians Of The Galaxy looks crisp and exciting through the HD50’s lens, but it’s the vibrant colour palette that really shines through. The yellow jumpsuits, green alien skin and purple-hued explosions are rich and inviting. Lens flares or flashy visual effects shine bright and punch with clarity. That vivid approach, though, can look a touch overblown at times, especially when watching a more natural-toned film like The Imitation Game. Turning the Brilliant Colour setting off calms it down a touch, but take care not to take away too much of the HD50’s likable exuberance. Skin tones are textured and imbued with warmth, but blacks could go deeper to add more punch and depth to a scene. The monsters’ silhouettes in Godzilla are teasingly shown for heightened tension, but are difficult to distinctly make out against a night sky. The forest scenes are awash with a general sense of darkness, and the projector can struggle to clearly define leaves, soldiers and giant creatures in the midst of it all. Unsurprisingly, the issues with black levels and subtlety come across more obviously with upscaled DVDs. There’s the inevitable softening of edges and loss of detail, while the colours are just as extravagant and warm. Overall, though, for the price, the HD50 comes up with a decent picture. 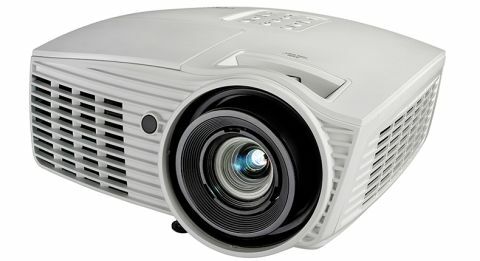 If you’re really keen on 3D films, however, you may want to try a different projector. While the colours remain vibrant and dynamic, there are instances of image instability. They’re not so persistent as to damn the HD50, but they catch our eye enough to bother us. The panning shots in TT: Closer To The Edge are fairly judder-free, and there’s an exciting sense of depth as the superbikes zoom across the island. We just wish the HD50 delivered a smoother, more comfortable experience throughout. You’ll need both the small RF transmitter and the active-shutter glasses (£80 per pair) for 3D. The glasses won’t suit everyone – we find them rather heavy on the bridge of our nose. The HD50 is compact and nicely made, with the manual focus ring surrounding the lens being easy to use when tweaking the picture to sharpness. While you can, of course, adjust picture settings by eye, we would always use a THX Optmizer disc to get the best results. Optoma’s PureEngine settings are worth a twiddle, but stay far, far away from PureMotion – it makes the picture look too smooth and artificial. The remote control has a useful, if bright, backlight, but the relationship between the buttons and on-screen menu can be a touch unruly. Press a button and there’s either a lag or a three-step jump when you wanted only one. This gets increasingly frustrating the more you use the HD50. The Optoma HD50 keeps connections simple, with two HDMI inputs for your digital sources. There are inputs for composite, component and PC connections, too, so those with analogue sources aren’t left behind. There are no built-in speakers with the HD50, so you can’t just plug in and play without having all the home cinema trappings. Still, we would always suggest you invest in a 5.1 surround speaker package when using a projector anyway. A budget system such as the Tannoy HTS-101 (£350) together with a talented budget AV amplifier such as Yamaha’s RX-V377 (now available for £200) shouldn’t break the bank and will make a far more enjoyable experience than you’d get from typically thin-sounding projector speakers. The Optoma HD50 isn’t perfect, but for £1000 it offers a richness that certainly keeps you drawn to the picture. The motion issues might worry those who enjoy 3D Blu-rays, and you’ll have to expand your budget for more components if you want to build a home cinema based on the Optoma HD50, but it’s well worth a look if you want to upgrade from a TV screen to a much bigger, brighter screen.